This Gentleman have just invested a lot of money in a brand new Indian Twin, year 1912-1913`sh. Its enamel shines and the tirepump is still clipped to the handlebars. This bike was Indians ultimate seller, even if still operated with direct drive and started by pedals as an ordinary (but heavier) bicycle. Gearbox came in 1914 even if direct drive was then still an option. Engine is of IOE type still, called the Hedstrom engine by those familiar with the marque. This bike is just a beautiful machine, fragile looking but still a workhorse. Rear carrier casted in steel, suspension both front and rear by leaf springs, all mechanical controls by rods and flexible joints. Look at that flimsy looking but still strong front fork, mudguard braces as thin as welding rods. You bet the steel selected for this litle marvel is of first grade quality. 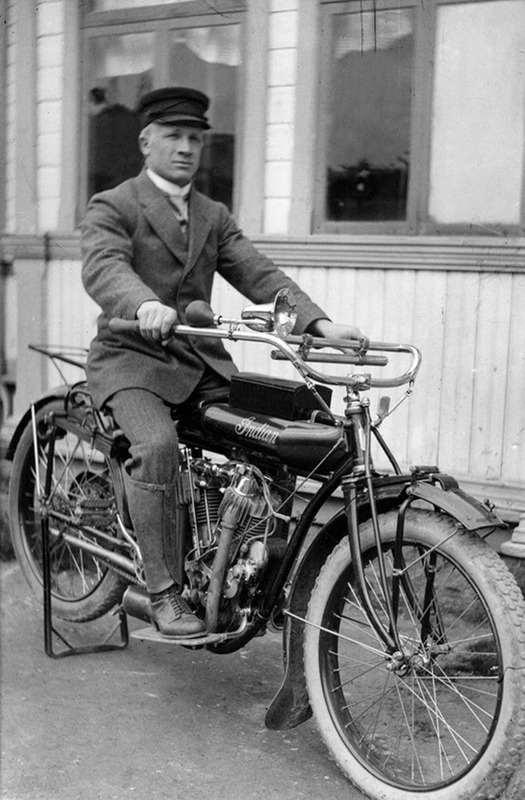 Production scored 32000 redskins out of the factory in 1913, the bike pictured is what people wanted to get a motor in these years.